The Sunny Health & Fitness Treadmill features 9 built-in workout programs, handrail controls, and phone/table holder that will add comfort and accessibility during any workout routine. This well designed treadmill features an easy folding mechanism and soft drop system. The soft drop system will assist you when opening the treadmill, avoiding a big slam or damage to your wood/carpet floor. It features an LCD screen that tracks your speed, time, distance, pulse and calories which makes it easier to track your fitness goals. 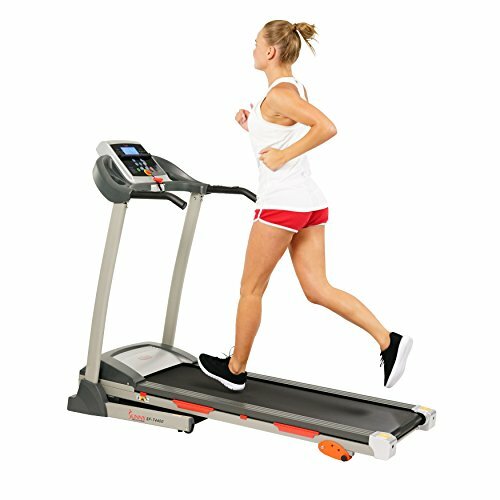 The Sunny Health & Fitness Treadmill is expertly designed for maximum performance, optimal comfort and ultimate efficiency, with a maximum user weight capacity of 220LBS.